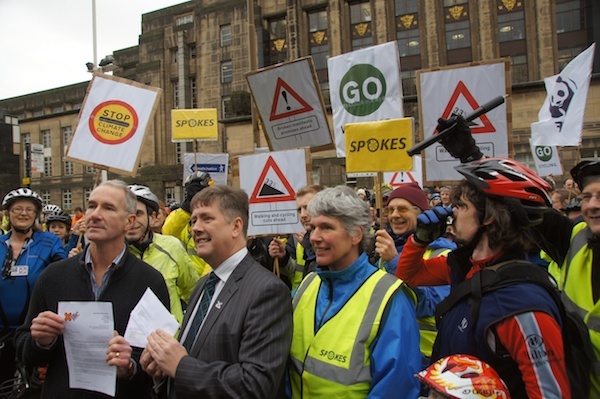 A large group of cyclists today gathered outside St Andrews House in Edinburgh to call on The Scottish Government to invest in cycling and walking and low carbon transport, and fully fund their own plans to meet Scotland’s climate change targets. The group met with Tranposrt Minister Keith Brown to hand over a list of their demands. We also spotted Green MSP, Alison Johnstone and Labour MSP Claudia Beamish among the cyclists. “The government must now step up and fully fund all of the measures set out in its own plans to meet our climate change targets, the Low Carbon Scotland Report on Proposals and Policies. This demo was organised by Stop Climate Chaos Scotland. Organisations represented will among others include WWF Scotland, Friends of the Earth Scotland, Transform Scotland, Spokes and WDM Scotland. The action was supported by cycling ace Chris Boardman MBE, Britain’s most successful cyclist to date, although he was not actually in Scotland for the event. “It’s great to see that so many people in Scotland are enthusiastic about cycling as a low carbon form of transport. We all have a responsibility to help tackle global warming and this is a clean, healthy way to help reduce our carbon emissions.